Supplier & Trader of Metal Ceiling & Aluminum Ceiling. Our product range also comprises of False Ceiling and Roofing Sheet. With the support of our procuring agents we are offering our clients quality-assured Mineral Fibre Tiles Ceiling that are suitable for both commercial and residential buildings and have accurate dimensions for easy installation. These fiber tiles are procured from the trustworthy vendors’ of this market under the vigilance of our procuring agents. Apart from this, we provide these fiber tiles in innumerable patterns, designs and finishes so that these can fully satisfy customers’ requirements. 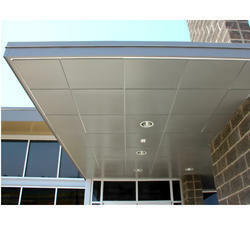 Backed by a diligent team of professionals, we have been able to offer Aluminum Ceiling. These products are widely used in restaurants, exhibitions halls, hotels, petrol pumps, offices, showrooms and other places. Offered false ceilings are manufactured by our vendors’ skilled professionals using optimum quality aluminum and ultra modern technology. Clients can avail the entire gamut at affordable prices. Our organization is engaged in manufacturing and trading best quality range of Metal False Ceiling. These perforated metal ceilings are highly efficient and very durable structures that provide great support to various electrical wiring as well as convenient for its easy maintenance and eye pleasing designs. 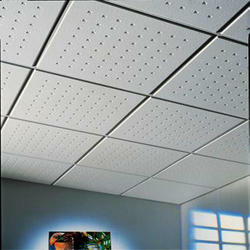 Our perforated metal ceilings are corrosion resistant and great dimensional accuracy. 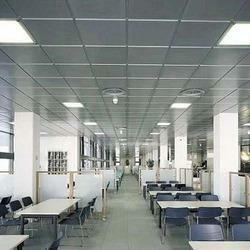 We are offering our perforated metal ceilings to our clients at very economical range of prices delivered on time.